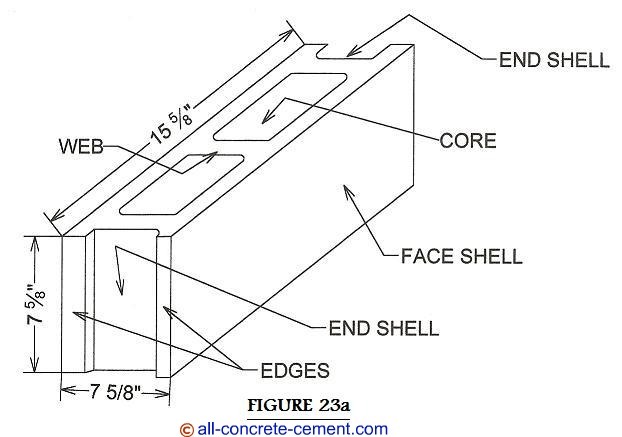 Concrete block is also known as cement block, foundation block, and concrete masonry unit (CMU). These all refer to the large rectangular bricks made from Portland cement, sand, and fine gravel. The three normal block sizes for foundation walls are 8x8x16, 10x10x16 and 12x12x16 with actual sizes 7 5/8”x7 5/8”x 15 5/8”, 9 5/8” x 9 5/8 x 15 5/8, and 11 5/8” x 11 5/8 x 15 5/8 respectively, figure 23 show an 8 inch block dimension. A detail of how these concrete block unit (CMU) stacked together to form a foundation wall is shown in detail 20. As shown these blocks are build on top of footings reinforced both vertically and horizontally with rebars for strength and durability. 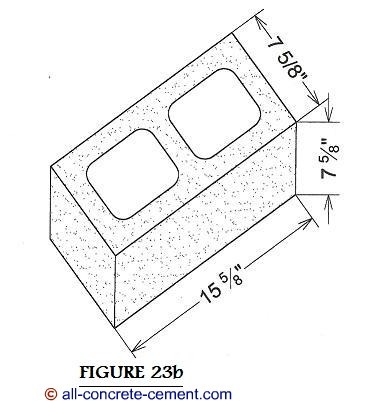 For block walls intended to support home or office basements, 10 or 12 inch wide block are used. The strength of these block come from the grout added to fill the cells and the steel reinforcements. The bigger the block, the bigger the cells, the more grout it will take to fill and therefore stronger. For 2 to 4 feet high foundation walls, 8 inch block are commonly used but they all need to be grouted solid and reinforced with rebars. Hold downs, straps, and anchor bolts are necessary for the support of the main structure all require the foundation to be fully grouted. The six inch block 6x6x16, actual dimension 5 5/8”x5 5/8”x 15 5/8” are mainly used for screen walls, walls at property lines, curb walls, divider walls for fireproofing purposes, etc. These are rarely used for structural purposes.